If multiple effects and titles has been added, real time processing may not catch up the timeline playback. This real time processing is delayed due to the heavy data loaded on the playback operation. While playback is performed, the lines of the parts where rendering is required are displayed in red (overloaded) or in orange (loaded). Performing rendering enables smoother playback. Realtime processing sometimes cannot keep up when playing back a timeline. The line of the part judged as requiring rendering when playing back changes color. The line colors indicate the following states. A clip matching the project settings is placed. Rendering is required (overload area). Rendering is judged based on the remaining buffer set by [Application] in [System Settings] → [Render], and a red line is displayed for overload areas when the remaining buffer is less than the preset value. When data such as CG animation has been placed one frame at a time as consecutive still images on the timeline, rendering the area will not lighten the load of playback processing. In this case, use the [Render and Add to Timeline (Between In/Out)] function to replace with the exported clip. Rendering is enabled even if the clip becomes out-of-position by a ripple delete, for example. Tracks with mute set to video parts cannot be rendered. It is recommended to export the file using the exporter if you need to use rendered clips. When rendering is performed, a temporary file is created in the “rendered” folder. Make sure that there is enough disk space for temporary files before starting rendering. Render all the areas that are judged as overload (red) in the entire sequence. 1) Click the [Render In/Out (Render Overload Area)] list button on the timeline. 2) Click [Render Sequence] → [Render Overload Area]. To cancel rendering, click [Cancel] in the [Render] dialog box. Lines in the rendered areas on the time scale change color to green. Click [Render] on the menu bar, and click [Render Sequence] → [Render Red Area]. Overload (red) and load (orange) areas on the entire sequence can be rendered at a time by the following operation. Click the [Render In/Out (Render Overload Area)] list button, and click [Render All] → [Render Loaded Area]. Click [Render] on the menu bar, and click [Render Sequence] → [Render Orange Area]. When the In and Out points are set on the timeline, only the range between In and Out points is rendered. Render all areas that are judged as overload (red) in the entire project that comprises multiple sequences. 1) Click [Render] on the menu bar, and click [Render Entire Project] → [Render Red Area]. Overload (red) and load (yellow) areas in the entire project can be rendered at a time. Click [Render] on the menu bar, and click [Render Entire Project] → [Render Orange Area]. Render only the areas that are judged as overload (red) or load (orange). 1) Right-click the line of overload (red) or load (orange) areas on the time scale, and click [Render]. Render areas judged as overload (red) between In and Out points on the timeline. 2) Click [Render In/Out (Render Overload Area)] on the timeline. Click [Render] on the menu bar, and click [Render In/Out] → [Render Red Area]. Click the [Render In/Out (Render Overload Area)] list button, and click [Render In/Out] → [Render Overload Area]. Right-click the time scale, and click [Render In/Out] → [Render Overload Area]. All areas judged to be red, orange and light blue between In and Out points can be rendered by the following operation. Click [Render] on the menu bar, and click [Render In/Out] → [All]. Click the [Render In/Out] list button, and click [Render In/Out] → [All]. Right-click the time scale, and click [Render In/Out] → [All]. Overload (red) and load (orange) areas between In and Out points can be rendered at a time by the following operation. Click [Render] on the menu bar, and click [Render In/Out] → [Render Orange Area]. Click the [Render In/Out (Render Overload Area)] list button, and click [Render In/Out] → [Render Loaded Area]. Right-click the time scale, and click [Render In/Out] → [Render Loaded Area]. Render only overload areas (red) or load areas (orange) around the timeline cursor position. 1) Move the timeline cursor to the area to be rendered. 2) Click [Render] on the menu bar, and click [Render Cursor Area]. Areas of the same line color on the time scale are rendered around the timeline cursor position. When there is a transition in same-color lines, the rendered area becomes the area up to the In or Out point of the transition. Perform rendering in individual clip or transition units. If you perform clip rendering on a clip with alpha effect, alpha information will no longer be applied. Keys, transparencies or transitions between tracks (effects set in the mixer area) cannot be rendered. In this case, take the alternate method to render a part of the timeline. 1) Right-click the clip to be rendered, and click [Render]. To render a transition, right-click the transition and click [Render]. When rendering is completed, a green line is displayed on the clip. When a transition has been rendered, the center line of the transition changes color to green. Click [Render] on the menu bar, and click [Render selected clip/transitions]. Render between In and Out points on the timeline, and export only video clips as a file in AVI format. Exported clips are placed on the V/VA track. 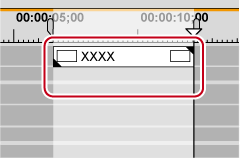 1) Set the area of the clip to export from the timeline with the In and Out points. 2) Click the [Render In/Out (Render Overload Area)] list button on the timeline. 3) Click [Render and Add to Timeline (Between In/Out)]. To cancel export, click [Cancel] in the [Render] dialog box. When rendering is completed, the video clip which has been exported to the V/VA track of the timeline is placed. If there is no space to place a clip on the track, a new V track is added. Click [Render] on the menu bar, and click [Render and Add to Timeline (Between In/Out)]. Right-click the time scale, and click [Render and Add to Timeline (Between In/Out)]. Exported clips are saved in the “rendered” folder in the project folder. Track areas set with title track clips and mute are exported as black clips. Exported clips are automatically deleted when a project is ended while these clips are not in use in the project. If exported clips will be required for continued use later, either place them on the timeline or save the project with the clips registered to the bin. To use exported clips in other projects, copy the file to another folder. Video images in the selected preview window (Player/Recorder) can be exported as still image clips and registered to the bin. 1) On the Recorder, display frames to be saved as still images. 2) Click [Create a Still Image (Save as)] on the timeline. 3) Set a file name, save destination, and [Save as type], and then click [Save]. The still image is saved in the specified folder, and the still image clip is registered to the bin. Click [Clip] on the menu bar, and click [Create a Still Image]. The still image is saved in the same folder as the project, and the still image clip is registered to the bin. Still images are saved as side-by-side in the stereoscopic edit mode. Video from a deck also can be saved as still image clips. The aspect ratio of still images sometimes is output different from that of the original image depending on the frame size. To output correctly, set to correct the aspect ratio. The settings of still images to export can be changed by [Importer/Exporter] in [System Settings] → [Still Image]. Manually delete temporary files that are created during rendering. Temporary files for rendering are saved temporarily in the “rendered” folder created in the project folder. Temporary files that are not referenced by a project are automatically deleted when the project ends, however, it is recommended to manually delete them when the “rendered” folder increases in size. 2) Select [Delete Render Files] and click [Files that are not Used] or [All Files]. Click [Render] on the menu bar, and click [Delete Temporary Render Files] → [Files Not Used] or [All Files]. Set when to automatically delete invalid rendering files (i.e. files not referenced by a project) at [Application] in [System Settings] → [Render]. The temporary files created in the “rendered” folder can be freely edited (e.g. renamed, deleted or copied). However, temporary files such as [Render In/Out] that are referenced by a project cannot be edited. When a clip has been placed on the timeline by the [Render and Add to Timeline (Between In/Out)] function, the clip becomes an offline clip when the original temporary file is edited.